Many Cisco Routers allow you to host your own virtual machine directly inside a router. I went through the documentation, especially Service-Containers-Tutorial.pdf and Ubuntu – Building a Service Container.pdf where very helpful. But i didn’t want to go the „Ubuntu-Desktop-14.04-LTS“-way which was described. save some compute/cpu/dram/harddisk-ressources by not installing an Ubuntu-Desktop-Environment inside the Router. Just network services, please! Here I’ll use Ubuntu LTS, but the „Desktop“-Release to get the „Virtual Machine Manager“-GUI. 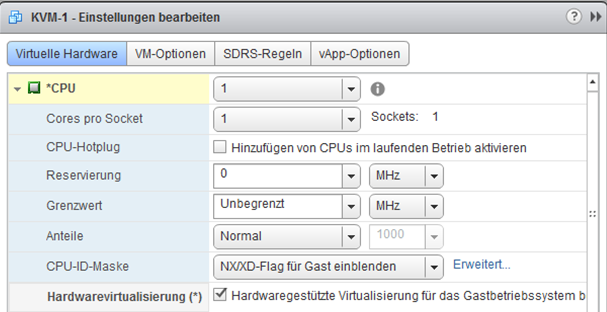 Don’t forget: this „KVM Virtualization Environment“ will run on top of an VSphere-ESXi-Host. I store my ISO-Images on an central NFS-Datastore.